Does Donald Trump read New Eastern Outlook? You would not think so, but whatever we say about his relationship with North Korea seems to come true. Perhaps he finally understands what this journal is telling him, but it may be too late. We told him that the only reason the US now understands the threat North Korea poses is that the secretive Communist state is no longer strange, because Trump’s US has become increasingly like it without North Korea changing at all. It’s been pointed out that holding a nuclear summit with Kim Jong-un was the stupidest thing ever done by any politician at any time, as it made this bankrupt state a member of the most powerful international club, justified its policies to its own people and made a maniac into a statesman who had to be treated as such, just as the US voters did. This is after Trump himself went to the UN last September and violated its Charter by making a speech threatening to blow North Korea to smithereens, which would have got the US expelled from the UN, and now he subject to all kinds of sanctions. If the UN had any teeth He has then had the cheek to write to Kim lamenting this “missed opportunity”, which he himself has spurned, thereby achieving the seemingly impossible feat of making the murderous oppressor into the good guy. By allowing matters to get this far, Trump has let the genie out of the bottle. Shouting at it won’t persuade it to go back in. Appeasing Hitler got the world nowhere, and now Kim Jong-un has tricked the US into treating him the same way, we all know what to expect, and who has put us here. To an extent, US behaviour in this matter has followed the usual pattern. The US is still wedded to the idea that its own values and systems are intrinsically superior to everyone else’s, and this explains the country’s success. Exactly the same language was used by the Soviet Union when the US claimed to be the antithesis of it, and has been used by all great powers to justify every aspect of their behaviour. This is why Recep Tayyip Erdogan’s words about “recreating the Ottoman Empire” are taken seriously in the European countries, which have experienced both Muslim conquest and Communism. All this has led the US to believe that every other country wants to be like the US, or has something seriously wrong with its government. They may not say it, but White House policy wonks have always treated other countries as funny little coloured blobs on the map, whose resources might be used to benefit the US, and thus the world as a whole, but have no intrinsic values and systems of their own to offer. Like the caged animals who prowled around The Kremlin during the Soviet Union’s last days, they are incapable of believing that countries can prosper by being different, no matter how much evidence is presented to the contrary. But the US hasn’t been able to defeat North Korea, despite all the aid to South Korea and the fall of Pyongyang’s old Soviet paymasters, because the alternative it is offering isn’t as good as the US thinks it is. Having fought the US in the 1940s, North Koreans don’t see it as the saviour even if they want a change. Their own survival has depended for so long on being anti-American, they are not going to pull the regime down from within without a system they understand and can see a future in, and all the US is offering is its own triumphalism, not a rebuilt state, as the residents of Iraq and Libya have learned the hard way. Trump probably thinks he is above previous policy failures, with his new brand of populist bluster and anti-establishment appeal. But he will never be able to offer anything either, because he is Donald Trump. Whatever their private thoughts, North Koreans have been brought up to believe that their leaders are great figures, with superhuman powers. Every time they speak, or are spoken about, they command respect. Every time Trump makes a statement, or is talked about by his defenders, he has the opposite effect on any audience, even his most diehard supporters, who are reduced to bleating about how he won, and how many millions he has, rather than the virtues of his actions as president. When you isolate a country, you do not complain about it, you just ignore it. Only when you are asked a direct question do you explain, once again, why you are isolating it. Trump couldn’t maintain such a policy if he tried. Everything has to be justified the Donald way, loudly and with the most self-inflating words he can find. He had to pick a fight with North Korea because he had to show himself superior to an enemy that will collapse under its own weight eventually. Leaving it to do so would have proved the US point, but it would also not explain how someone like Trump could have ended up its president. Trump’s approach to North Korea could never be other than an utter failure, He has elevated Kim to statesmanship and got nothing in return. North Korea cannot make its weapons work, and as Trump himself has pointed out the US has far greater numbers of nukes which do work. But North Korea isn’t going to ask the US for anything as long as it has those dud weapons which have got it to this point. With someone else in charge, the US would still have taken a long time to destroy North Korea but would have done so. Now Donald has put the boot on the other foot, and all the Diet Cokes and dubious offers of assistance won’t make that fact go away. It is easy to picture the scene. Donald Trump, theoretically the most powerful man on earth, sits down in Singapore with yet another leader of one of those little countries who populate those funny maps headed “Rest of the World (Non-US)”. Just prior to the meeting, the State Department has coached Trump in to how to say his name, what sort of gestures he should and should not make and what answers he should give if he gets stuck. What the State Department might not have the nerve to tell Trump is that this will be a meeting unlike those any US president within living memory has held. Kim Jong-un is not a dodgy ruler of a dodgy state with a sub-US system, who is looking for a handout and can be relied upon to sell his citizens down the river if he gets a courtesy call and photo opportunity with a bigwig every five years. He is the man Trump has accepted into the Nuclear Club by taking him seriously, unlike others who claim to have nuclear weapons capabilities but not the necessary expertise to get them off the paper. Kim will never concede to the Great Satan, when demonising him has got him this far and sanctified his country’s heritage. He knows more countries long to do as he has done, and force their way to the top international tables, than beg to be vassal states in exchange for strings-attached assistance. All the countries which once joined in isolating North Korea will want to be its friends, and obtain this type of success rather than US-style “success”, which consists of the US doing it all it can to prevent that country having the US democratic and human values its people cry out for. Trump tries his usual tricks to impress Kim, who isn’t interested. The longer the meeting lasts, the more outrageous Trump becomes, because he has no other option. Kim listens and then states his position calmly, knowing he has already called the US bluff. The fact of him being in that room under these circumstances makes Kim a major world figure, able to negotiate as an equal and set his own terms. If he rejects what Trump says to him, this only magnifies his success, and the US won’t do anything about it because they are the ones who made him a statesman instead of a pariah like Saddam or Gaddafi. Kim will continue to insist on total denuclearisation, which will make him the man who saved the world from weapons infinitely more dangerous than his own. Trump won’t agree, but will offer aid. Kim won’t accept US aid either, unless he can present it as a victory for himself. If the US emerges from the negotiations strengthened, the world will expect that because it is the US. If North Korea emerges strengthened on its own terms, not those demanded by the US, who knows which other country might think it can achieve the same thing by being as horrible and aggressive as North Korea is, even if it means bankrupting itself to do it? When Ronald Reagan said after his summit with Gorbachev that if Americans met Russians they would talk about common human concerns rather than the political differences between their two countries he was perceived as a peacemaker. If Trump said the same after meeting Kim Jong-un he would be laughed off the podium. You cannot respect North Korea and be America, or even human, but Trump has forced himself to offer that respect by thinking himself a lot more capable than he is. Trump claims his actions are motivated by a desire to prevent conflict. He maintains that he will end the North Korean nuclear programme because that is the only way of doing this, oblivious to Himoshima and Nagasaki, and the fact there would be no threat of conflict if the US had continued isolating North Korea and watching it crumble like the Soviet Union did. All Kim had was his unusable weapons. Without US or Russian expertise, he had nothing except the mess his dynasty had made. Everything had been sacrificed for defending his artificial country and its system against a future “US aggression” North Korea had largely invented, so unless those weapons could be made to work his world was going to collapse anyway when no one in the inner circle could bear to keep it going. 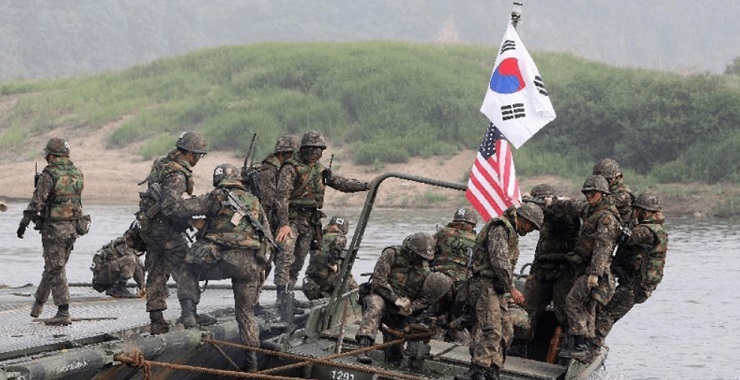 Koreans on both sides of the border would have rejoiced at its end, even if their attitudes towards the US, and the future, were very different. Trump has given those weapons political nuclear capability they should never have been allowed to have. The US could have walked in and taken over the North Korean nuclear programme if it had carried on forcing it to survive alone, or with increasingly reluctant and exploitative Chinese partners. After all, it did in the former Soviet Union, after Reagan picked his moment to offer a friendship which could only result in the healthy friend assisting the suicide of the terminally ill one. Now the world has a choice: ruin your country to make it important, like Kim, or gain protection in exchange for vassal status, like so many US allies. The US always complained about the Soviet Union doing exactly what it itself does now, so few will publicly make such a choice when they can get to the top table another way. How many people want to live in such a world? Isn’t this what the US is supposed to protect us from? It remains the best means of doing so, because most people will always want what the US represents, and what it thinks it is. But after various administrations did their best to undermine their own country and friends for so long, Trump has thrown the US in the dustbin, and the aspirations of most of the planet with it, by picking a fight with a crackpot state which couldn’t have staggered on beyond this generation, if that is the outcome the US really wanted. Kim Jong-un is the world’s leader now, not Donald Trump, and he is behaving far more like one, as any summit will make clearer to that world. Maybe Trump realises that this is what you get when you are more interested in enemies than friends. The US has not destroyed North Korea before now because its nuclear arsenal might one day be made to work against the Russian Federation, obviating the need for yet more bases. Not only was it a threat, it was a cost-effective threat. North Korea provided everything the most rabid freemarketing red-baiter desired, as long as it was as bad as it was and could thus be made worse with US assistance. But now Trump has even thrown that away. Russian readers will be very familiar with the chess term “Zugzwang”, meaning a situation in which the obligation to make a move in one’s turn is a serious, often decisive, disadvantage. It seems Trump has just realised this is where he is, and has led everyone else, and that he does not have the resources to change that.